At first sight of it you would think that testing a metal detector would be quite a simple task. Just dig a few holes bury a few coins and see how deep you can detect them. In practice its not quite so simple or straight forward. Books, Magazines, Field tests, and other publications tend to steer clear of any serious tests, preferring to quote in air tests that are just about useless. Actual in ground performance usually falls far short of advertised depths. So called independent field testers are usually under pressure from editors or on a bung from manufacturers to exaggerate depths. You may be surprised to learn that many of the modern coins being minted today are actually made of steel. 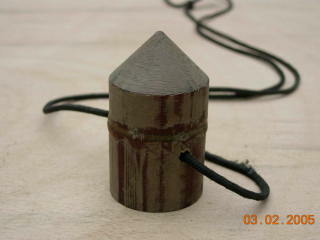 A steel blank is struck and then coated with a very thin layer of copper. Probably three quarters of the UK 1p and 2p copper coins have now been replaced with these steel clones. 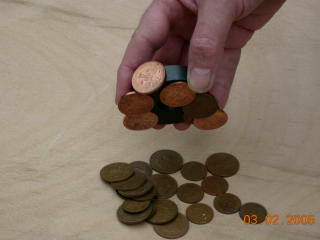 If selecting coins for metal detector tests it is easy to spot the steel coins by using a magnet. The pure copper 1p and 2p are ideal for detector testing, and will give about the best depth you will get on coins. The older English coins such as the 1 penny and 1/2 penny are also suitable for testing if you have them. Whether you are testing your detectors depth on a single coin, or a hoard ( see jar below ) it is most important to dig the smallest diameter hole possible. To avoid the detector detecting the hole. If you dig a large hole to bury a jar of coins and do some tests you may find that after you have dug up the jar and filled in the hole. The detector still detects the hole where the ground matrix has been disturbed. If you are fortunate enough to have a nice piece of lawn that is uncontaminated with junk. It can be useful to bury a row of coins. Say a line that is parallel to a fence, with the coins about 60cm apart and gradually getting deeper. You need to remember where the thirst coin starts, perhaps in line with a post or some other object, and about a metre from the fence. You need to check the ground with your detector before you start to make sure it is not full of junk. If the grass is damp you can carefully cut out with a sharp knife a small plug of grass about 50mm diameter. then with a spoon or similar tool dig your hole to whatever depth you like. Put in the coin, making sure it is laying flat and not on edge then fill in using all the soil you have dug out and finally replace the plug of grass. in a couple of years this type of test patch will give very accurate results. But make a note of how deep you have buried the coins, it is easy to forget. Put the first coin at 50mm then going down 25mm each coin. 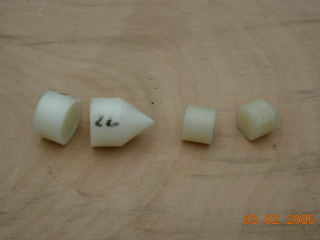 An alternative method for testing on single coins is to make a set of testing plugs as described below. 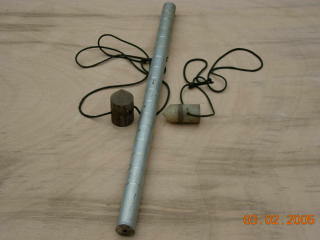 The basic idea is that a bullet shaped plug that contains a coin, made from hard wood, Nylon, or other engineering plastic is banged in to the ground with a hammer and driving rod to a particular depth. The ground needs to be not to hard for the plugs to survive. 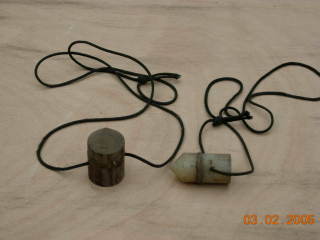 After the plug can be retrieved by being pulled out of the ground by a strong nylon cord, to be used again. The plugs themselves can be roughly made from hardwood, or machined from some sort of engineering grade of plastic or Nylon. When testing your detectors ability to find a hoard it will be necessary to prepare a sample hoard to be contained in a jar or cloth bag. Using a magnet make sure there are no iron clad coins. 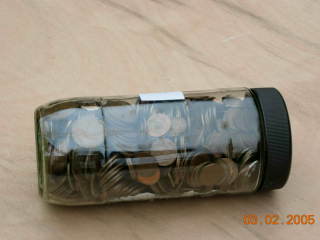 it takes about 500 coins to fill a coffee jar. It is most important that you dig the smallest diameter hole possible, so as to disturb the soil as least as possible. There are very few detectors that will detect this type of hoard more than about 45cm. Try it and see for yourself. Using this method it is difficult to know if the detector is detecting the hole you have dug or not. Sometimes you can remove the hoard to find the detector still detects the hole. As with burying single coins if you can leave your fake hoard buried for a few years it will then behave more like a genuine hoard. When doing these tests experiment with your detectors settings. All metal mode, various disrim levels/programs, ground exclude. If you have the time and can be bothered the only true way to test a detectors is to bury your hoard without actually digging a hole. You need to find a steep bank or ditch, or even dig one. Then with a small hand trowel dig some small tunnels at different depths horizontal so that you can push your Jar/bag of coins sideways as far as possible. this method will give results close to a genuine hoard.